Status: Contest finished on 01-01-2010. Clubbing9 and 220V Recordings are running a new remix contest, giving the chance to remix three tracks from Jarah Damiël’s forthcoming single “Magneba”. Good luck! 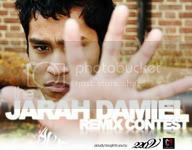 Clubbing9 presents the Jarah Damiël Remix Contest in association with 220V Recordings. Clubbing9, the foremost provider of all entertainment and nightlife news in Malaysia has teamed up with Malaysian powerhouse label 220V Recordings to offer aspiring producers the chance to remix 220V artiste Jarah Damiël’s single ‘Magneba’, originally produced in Holland. ‘Magneba’ is the second single from Jarah Damiël on 220V Recordings, and it will be released in April / May 2010. This special remix contest will give dance producers the chance to remix one of his biggest forthcoming tracks on 220V Recordings for 2010. Jarah started DJing in 2004 and has gone from strength to strength in his music career, getting bigger bookings and making regular appearances at clubs & music festivals in Holland. His productions are featured on many record labels internationally and he has already released 2 solo EP’s under his name. 220V Recordings & Jarah Damiël is giving all budding DJs and aspiring producers the chance to remix Jarah’s forthcoming single ‘Magneba’. Clubbing9 is proud to bring this opportunity to music producers around the world. The top 3 chosen remixes will be exclusively released on Jarah Damiël’s ‘Magneba EP’ in April / May 2020 – alongside the original mix. The top 10 remixes will be featured on www.clubbing9.com.my – The official website for the Magneba remix contest. Not only that, the top 3 winners will also be featured in a one-to-one interview on C9, and will receive a digital release deals for single EP releases on 220V Recordings for 2010/2011. 1. December 1st 2009 – January 1st 2010 : Download phase – The remix parts of ‘Magneba’ will be made available to producers for download. During this phase the entries can be listened to, but not voted for. 3. February 1st 2010 – Febuary 28th 2010 : Voting phase – The public votes for their favorite remixes by completing the poll. After a period of deliberation, the winners will be announced on or around March 15th, 2010. The top 3 winners will receive exclusive release deals for the Magneba remixes & digital release deals for their single EP’s on 220V Recordings. The top 10 finalists will be featured in a one-to-one interview on C9.